With the lowest ferry fares, the latest special offers and a speedier ferry service to Ireland, Holland and Britain - you get a better deal when you book online with Stena Line! Stena Line is an international transport and travel service company and one of the world's largest ferry operators. If your travel times are slightly flexible click here to take advantage of our new lowest ferry ticket fare finder comparision service that will open in a new window. Stena Line has a modern fleet of 36 vessels, consisting of fast ferries, traditional multi-purpose ferries, RoPax ferries for freight and passengers and RoRo ferries purely for freight. The Group has a significant market share in all its market areas. The strong position is a result of strategic corporate acquisitions coupled with continuous service and product development. The ferry route network comprises 18 strategically located routes in Scandinavia and around UK. Following a few years of change and development work, Stena Line now is a stable Group, offering leisure, business and freight customers cost efficient sea transport based on effective systems and adapted tonnage. Stena Line transports approx. 17 million passengers, 3.2 million cars and 1.5 million freight units every year. The phrase Making Good Time summarises the core of the Stena Line business in three words: fast ferries, enjoyable and efficient sea travel. For us and our guests onboard, travel is more than just getting from A to B; it's also about taking a break from daily routines and having a good time. Stena Line guarantees an enjoyable trip where the time onboard can be used to relax, spend time together, or eat well. Travelling with Stena Line should be good value, uncomplicated and stress free. Put simply, the travel alternative that beats the rest. Today's ferry customers are looking for more. Basic factors such as punctuality, safety, clean and well-equipped ferries with good service are now taken for granted, so at Stena Line we're trying even harder to give guests that little extra so they'll want to travel with us again. A way of meeting these new demands is to develop new products and services, and to further customise our offers to suit different requirements. Our ambition is that everyone should find a travel offer in our selection that they like. Many exciting travel offers have been developed to suit different tastes. These include Drive & Sleep, where customers drive on the continent following a prepared travel route that includes ferries and hotels, Pub Holidays with memorable eating experiences in Danish villages, lively After Work cruises between Göteborg and Frederikshavn on Friday evenings, atmospheric Trad Jazz cruises between Göteborg and Kiel, as well as Football & Rugby trips and Party Cruises with 60s and 70s music on routes between Ireland and Great Britain. Today it's important that travel and tickets can be booked quickly and simply, whenever and however the customer wants. Stena Line's guests can book trips at any time of the day or night, via telephone, Internet or travel agencies. Stena Line annually arranges around 500,000 holiday trips in Ireland, Great Britain, Germany, Poland, Belgium, Holland and Scandinavia. Our range includes everything from pure transport trips to package tours with accommodation and activities included, entertainment cruises and conference trips. Regardless of the type of trip the customer is making, the ferry crossing provides added value through the activities and entertainment offered onboard. Ticket sales, package trips and revenue from hotel and travel agents represent around 40 per cent of our turnover. We co-operate with a large network of external partners throughout Europe: travel agents, hotel chains, bus and train operators, car rental companies etc. One of the latest trends within tourism is that people are choosing to travel more frequently but to destinations closer to home. Taking their own car with them to the destination is also something that attracts many. Stena Line is thus investing heavily in flexible package tours, additional departures and in car transport. British and Irish passengers travel often to each other's countries and, in the British and Irish market, straight transport is the most important product. A great many Dutch travel to Great Britain, primarily to London, and Amsterdam is a relatively popular destination for British travellers. Denmark, Zealand and Northern Jutland, are the favourite destinations for Swedes. In Denmark, Stena Line is the largest arranger of skiing trips to the Swedish and Norwegian mountains. Germany attracts many Scandinavians every year and many Germans enjoy spending their holidays in Sweden. Poland, with fascinating old towns like Gdynia and Gdansk, attracts many Swedes, and Poles are keen to visit Scandinavian destinations. On the freight side Stena Line is working hard to offer customers what they want: a comprehensive route network, good service onboard, effective Internet and telephone booking, and competitive prices. To make the most of all possible synergy effects on our different routes and within our various geographic areas, Stena Line has divided its operation into four business areas: Scandinavia, the North Sea, the Irish Sea and Freight. The routes included in Scandinavia are Göteborg-Frederikshavn, Varberg-Grenaa, Helsingborg-Helsingør, Göteborg-Kiel, Göteborg-Travemünde, Trelleborg-Travemünde, Trelleborg-Rostock, Trelleborg-Sassnitz, Karlskrona-Gdynia and Oslo-Frederikshavn. Stena Line started originally with passenger traffic between Göteborg and Denmark , and these routes still form the backbone of the business with more than 2 million passengers per year. Stena Line is market leader on the routes between Sweden and Denmark . Transport passengers (private customers with car) are our main business, but there is also strong interest in cruises and package tours to Denmark . A considerable amount of freight transport is also handled. Stena Line's most popular route to Germany is Göteborg-Kiel, a route for passengers and freight that has operated since 1967. During the days of duty-free, the Göteborg-Kiel route was also a popular entertainment cruise. Today, transport passengers form the most important segment on this route. However, investments are also being made in conference and entertainment cruises. Göteborg-Travemünde is purely a freight route. The routes between Trelleborg and Germany are run under the management of Scandlines AB and attract both freight and private customers. The Oslo-Frederikshavn service was started in 1979, and is one of Stena Line's oldest routes. More than 70 per cent of guests onboard are Norwegians. The main product on this route is cruises with themes and onboard concepts that are customised to different passenger groups. Typical examples are dance band, hip-hop, student cruises and quiz weekends. Other product groups are transport/package, conference and freight. Stena Line's route between Karlskrona and Gdynia has expanded strongly during recent years and interest is steadily growing among private and freight customers in both Sweden and Poland . Stena Line started operating between Karlskrona-Gdynia in 1995 through its subsidiary Lion Ferry, but has operated under the Stena Line name since 1998. Stena Line is market leader in package tours between the two countries, with bus and group travel forming a large target group. Within the North Sea business area, Stena Line operates the routes Hoek van Holland-Harwich, Hoek van Holland-Killingsholme and Rotterdam-Harwich. The North Sea routes are operated by RoPax vessels and a high-speed ferry, and provide the fastest direct ferry link between Northern Europe and Great Britain for freight as well as passengers travelling by car, train or bus. The three routes are very popular with freight customers, although many private customers also travel between Holland and Great Britain . The oldest of the three routes, Harwich-Hoek van Holland, has been in operation since 1989. Stena Line's routes on the Irish Sea are Stranraer-Belfast, Holyhead-Dublin, Holyhead-Dun Laoghaire, Fishguard-Rosslare and Fleetwood-Larne. Routes on the Irish Sea include private travel and freight, with a high proportion of customers travelling several times per year. Stena Line is the largest ferry operator on the Irish Sea with over 3 million passengers travelling on our routes every year. 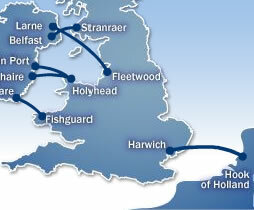 The Freight business area includes all routes used by Stena Line's freight customers. Booking centres throughout Europe sell transportation on all Stena Line routes via a common booking system.